Program and record perfusion flow and temperature over USB. When imaging cells in a rigid structure such as a chamber having a coverslip as an observation surface, one must appreciate the fact that any rapid changes in flow rate will translate to microdynamic changes in pressure within the optical cavity of the chamber. This causes the coverslip to behave like a diaphragm thus flexing out of focus due to the narrow depth of field of the microscope objective. To eliminate this problem at the lower flow rates and significantly reduce it at higher flow rates, Bioptechs recommends the Micro-Perfusion pump for use with all its micro-observation systems. The Micro-Perfusion Pump is a miniature, single or dual, channel, full-featured peristaltic pump designed specifically for low-flow rates. Unlike most peristaltic pumps that are driven by stepper motors, the Micro-Perfusion pump is driven by a tachometer regulated, multi-stage DC gear motor. This assures a smooth analog rotation of the roller spindle, free of instantaneous steps. It is regulated by either the internal control circuitry adjustable from 0.2-180 ml/hr or it can be interfaced with a computer through a DAIO port. Bioptechs provides a kit for this purpose that includes all cabling, software, and hardware needed for a dual pump setup. The pump comes with an external 9 volt AC adapter and also contains an internal 9 volt battery which can function as the primary power supply if needed. Please order tubing separately: a single .062″ I.D. tube or a dual tube that has two .062″ I.D. tubes for use as a dual channel pump. Although other tubing sizes are available, this size is generally best suited for imaging applications. 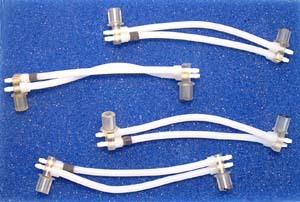 The pump tubes are available in silicone rubber and C-Flex. They are terminated with a 1/16″ tubing barb. 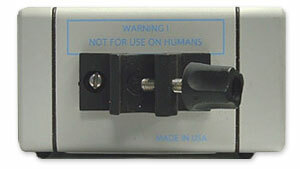 The base of the pump is threaded for easy mounting to a stand or fixture near the microscope. 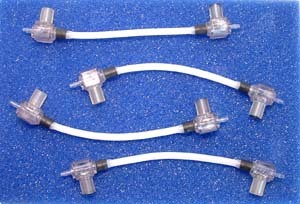 The Micro-Perfusion Pump Single Tube Set – single channel peristaltic tubing made of C-Flex for optimal durability. Also available in silicon. The Micro-Perfusion Pump Rod Mounting Clamp provides a method of mounting perfusion pumps onto conventional 1/2 ” support post. Makes positioning perfusion pumps adjacent to the microscope easy and convenient.